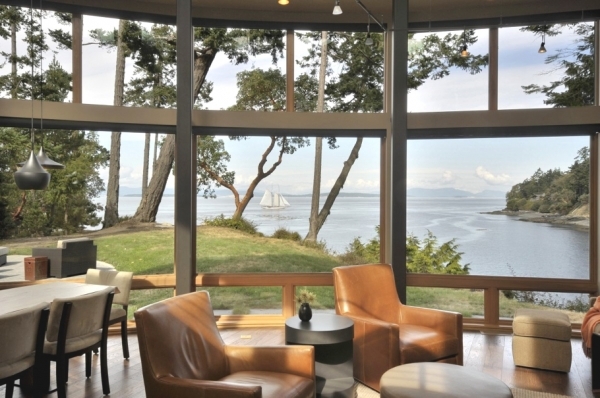 The Sunset Point Residence Project is located in San Juan Island, Washington. 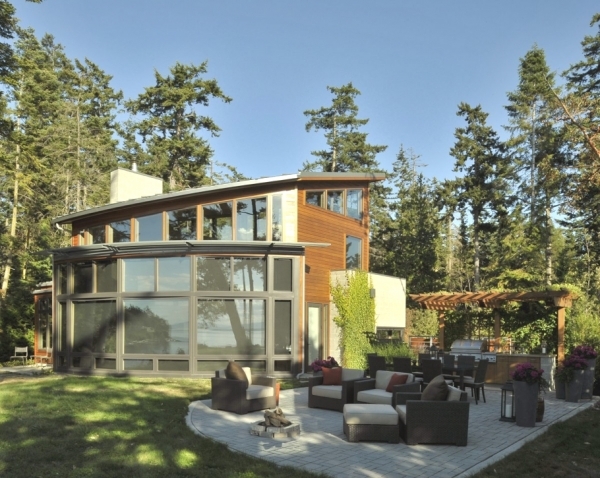 This 2365 square foot home was designed by David Vandervort Architects. 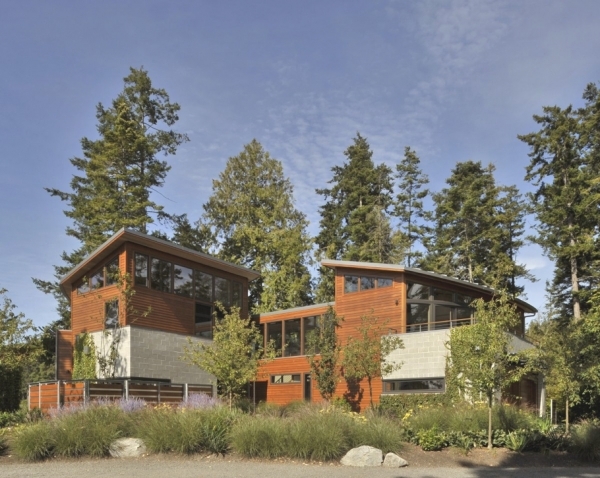 The family friendly modern residence is constructed with CMU block and cedar siding, and a steel and metal roof. 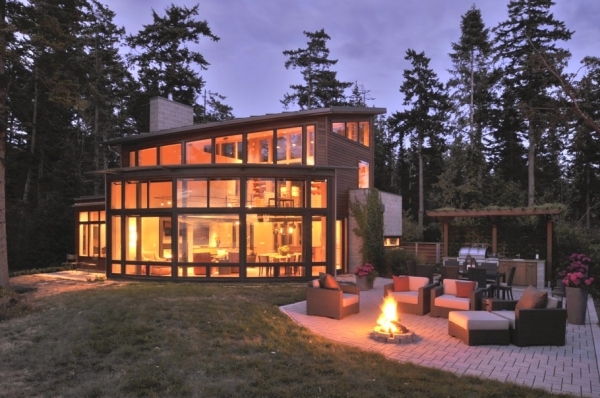 It has absolutely gorgeous views, curved glass windows, and an exceptional patio. 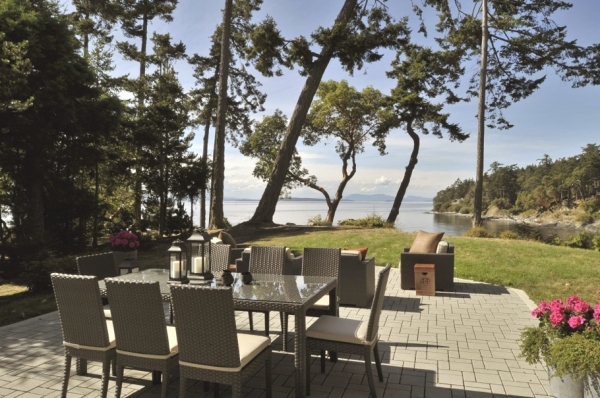 The patio has a wonderful view of the surrounding water. The level terrace has neutral furniture, a concrete fire pit, and a beautiful gas grill. 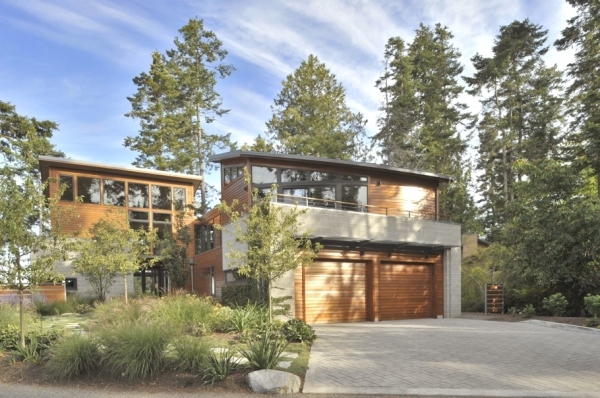 The inside of this modern residence has natural wood with dark brown and black accents. 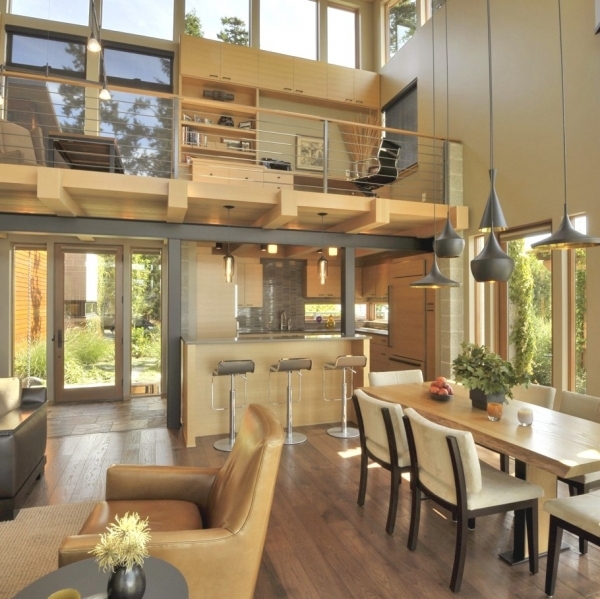 The living room and dining room are comfortably next to each other in this open plan. A central neutral rug, a neutral chair, and two neutral ottomans fill the space. In addition to the neutral furniture, two caramel leather chairs, sit facing the fireplace, with a silver table in between. The fantastic gray and black leather couch faces the beautiful wall of windows. The CMU block from the exterior is continued in the home by surrounding the fireplace. 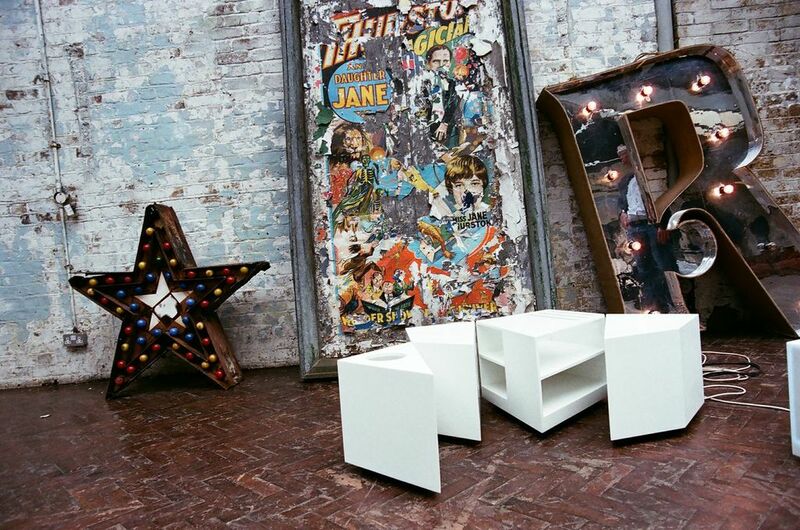 The dining table is made of natural wood, and fits nicely in with this family house design. Creme and dark brown chairs surround the table, and gray multi-shaped lights hang from the ceiling. 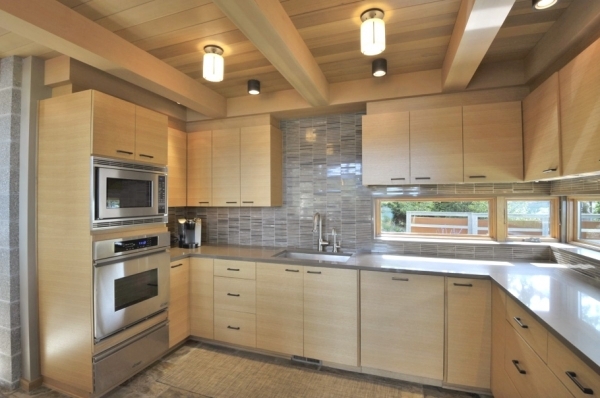 The kitchen continues with the natural wood color, but adds beautiful gray backsplash and countertops to the mix. The metal bar seats look absolutely fantastic against the natural wood, and they add a little coolness to the living and dining room area. 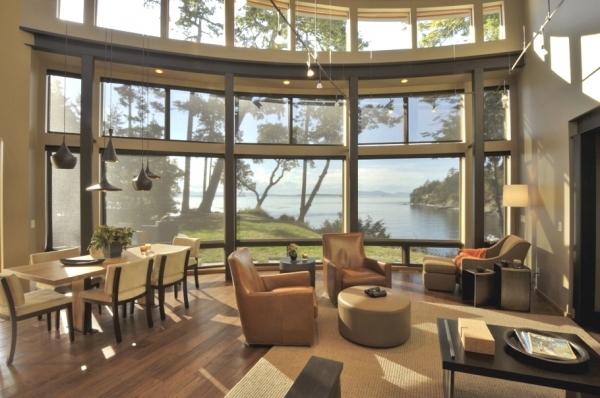 The master bedroom provides lovely views of the surrounding water, with wonderfully large windows. 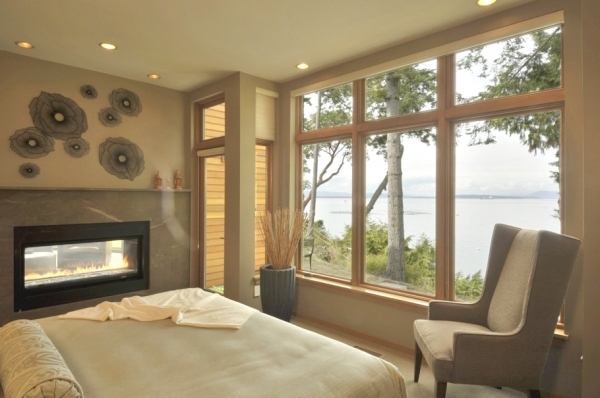 This modern residence continues the natural colors in the master bedroom. 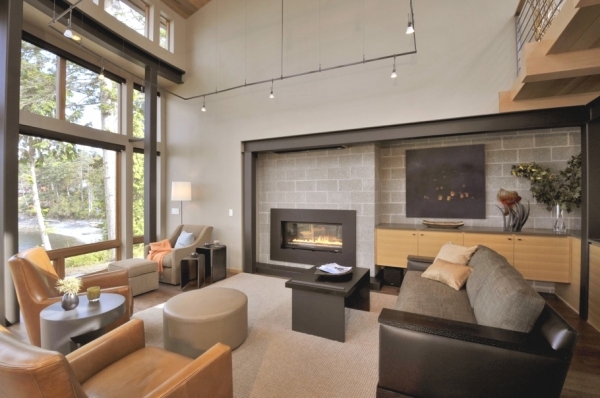 A gorgeous black outlined fireplace is set in the wall, providing warmth and luxury. Above the fireplace, black flower decals decorate the neutral wall. 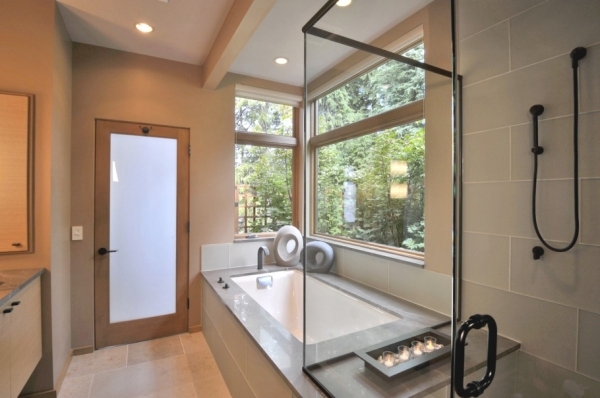 The bathroom has a modern bathtub and a glass shower, accented with gray. The black fixtures in this bathroom are absolutely gorgeous, continuing the dark accents throughout the house. 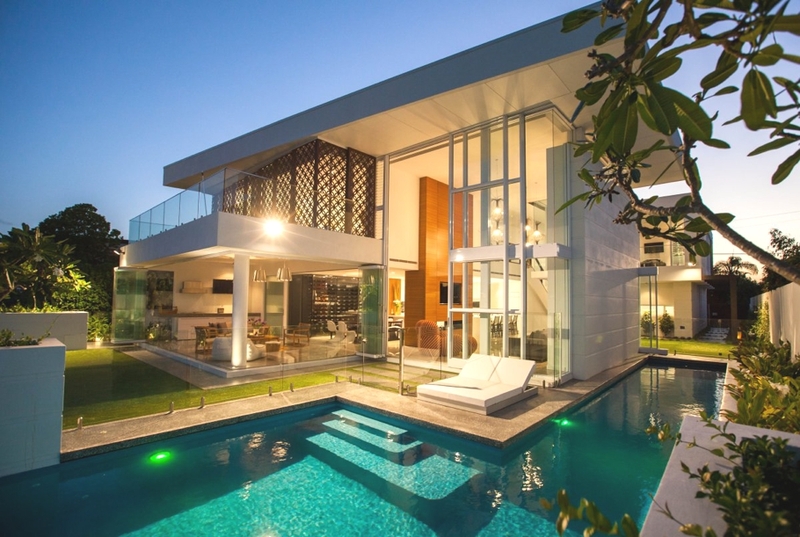 This family house design makes every space accessible, creating a unified home. 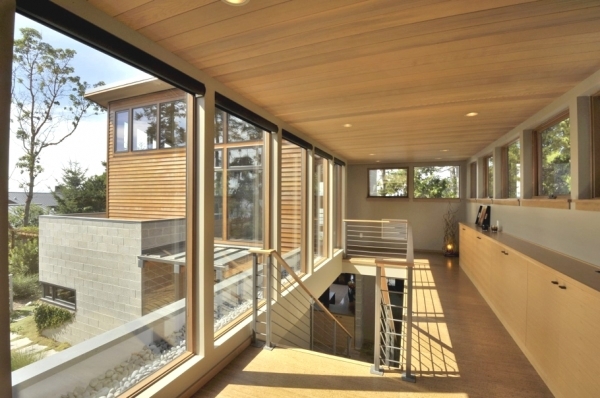 The curved windows allow for a calming and unique flow. The living room, dining room, and kitchen are closely set together, making this modern residence a dashing and family friendly place to call home.